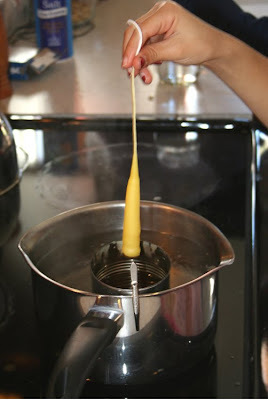 The kids have been asking to make hand-dipped beeswax candles for a while and since we've done the hand-rolled candles a few times, this was the next logical step in candlemaking for them. We used about 2/3 lb of beeswax from a local beekeeper who works with Paul. 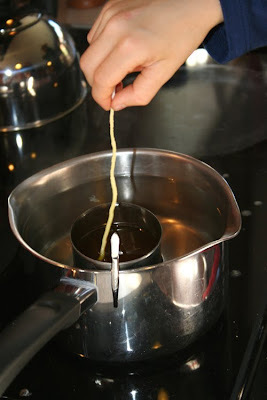 We started out by melting the beeswax in a tin can set inside a pot of almost boiling water. Once our beeswax was completely melted, we dipped our skinny cotton wicks, then straightened them out to ensure nice straight candles. Then we each took turns dipping for 2 seconds. After dipping in the hot wax, we'd take a quick dip in cool water to make sure our wax wouldn't melt back off with the next dip. 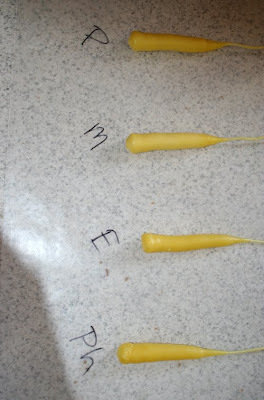 Then we laid them on labeled wax paper to harden completely. 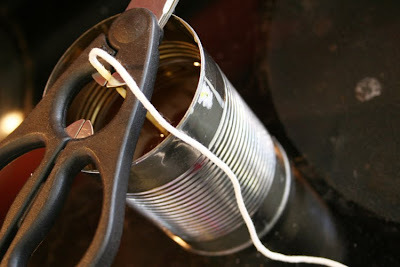 With the rest of the wax, I decided to put a wick down into the tin can (because aren't tin can candles just lovely?!) In retrospect, dipping into a mason jar probably made more sense and definitely would have been prettier to watch burning. 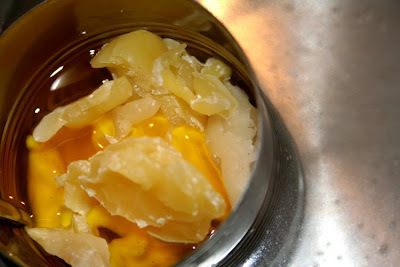 Either way, it smelled absolutely heavenly in our house today with all the melted beeswax! very very cool! our friend keeps bees and gave us a block of honeycomb drenched in honey. 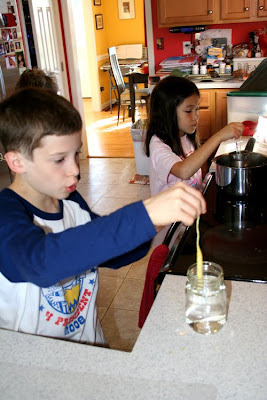 i have thoughts of candle making in our future! Looks like you made some nice candles. Thanks for the step by step, that's helpful! I LOVEloveLOVE the smell of beeswax. How lucky you are to know a local beekeeper! Looks like fun-perfect activity for November. We've done this a few times at various places but never done it at home. We'll have to try that! Oh, neat! The candles look beautiful. How wonderful that you were able to get the beeswax from a local farmer. Good idea to use mason jars. We'll have to try that! Dipping candles is something I've always wanted to do! Candle dipping is great fun and it looks like you all made some lovely candles. I think the only candles in our home are beeswax. They smell heavenly and just another gift from the bees. Is local wax less expensive or more than a craft store? I've not looked locally for wax. that's it! I am moving in! 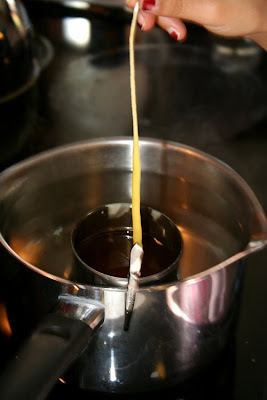 i love dipping beeswax candles. yours turned out so pretty! great job. we've been making some molded candles over here...the smell of beeswax is utterly uncomparable.